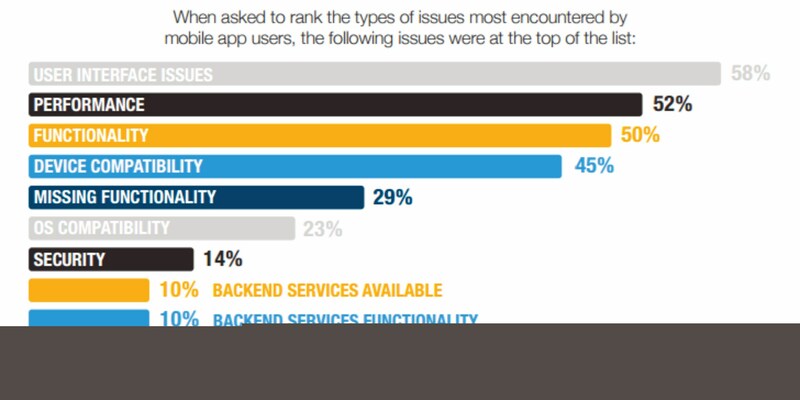 Given below are some reasons why mobile apps fail. Have a look at them and find out why your app doesn’t work. Your customers might not know that your mobile app actually exists. And when they are not aware of any particular app, how can you expect them to download it? So, the first and foremost thing that you need to do, so that your customers use and download your app is actively spread the word about it. Create a campaign strategy for the launch and an ongoing promotion of your app to ensure that your customers know it’s out there. Your app may have great features but if it’s clunky and not well designed, your customers will not use it. Even if your users download it, they’ll delete it after some time. After all, improper formatting is one of the main reasons why mobile apps fail. So, make sure it’s formatting is optimal and the design is simple and user-friendly. Put important information right at the top of your home page and highlight all the big events that would grab the attention of your users. Whether it’s an image or a piece of text, make everything small and appropriately formatted to keep the app moving smoothly and quickly. When people find purchasing from an app to be a time taking affair or a confusing one, they choose not to download it. So, if your customers aren’t downloading your app, it might be because of the unimpressive user experience. What you can do to increase your mobile app downloads is cut down on the number of clicks needed for purchase and research on how your customers’ prefer to search for your products. Doing a mobile performance testing is a wonderful idea as well. You can also add features like credit card scanner or Apple Pay to lessen purchase path friction helping a consumer decide whether to download the app or not. Include popular and relevant keywords in the title and description. Don’t overuse them. Ensure your title is relevant to the use and function of your app. Keep the description simple yet optimized. Highlight the features of the app as well as the selling points. Cater heavily toward your target audience in the description. Place screenshots that are important and make sure every image communicates your offering effectively. Include positive reviews you think to be relevant. When your customers have gone for shopping in the app store they might have found negative comments about your app and it may be due to this they have planned not to use it. In such a case, there is no need for you to hide the negative comments and post the praises only. Let them be online and visible. Just make sure to answer and solve the issues of everyone. This will allow people trust your brand and as a result, they will start downloading it. Reward system and discounts have become mobile app marketing best practices. So, you certainly need to give your customers these extra incentives. If you don’t, then your customers would turn to your competitors who offers amazing rewards and discounts and thereby download their apps. Give your existing users rewards for promoting the app to their friends or promote your app by offering it free for a short while. This is going to give you the boost in downloads. So, now you know the reasons why mobile apps fail and why your customers aren’t using your mobile app. To increase your app downloads among users all you need to do first is find out why your mobile app has failed and then act accordingly keeping in mind the suggestions given above. Next Next post: Mobile app vs Mobile website : Which is better?